2 Simple and Purple Mash Help - How do I move work between folders? All Categories ​>​ Purple Mash ​>​ Online Work ​>​ How do I move work between folders? You can move work between folders by simply clicking and dragging saved work from folder to folder in the Online Work section of Purple Mash. Please follow the steps below to see how to carry this out. Go to the online work folder and expand both the folder where the work is currently saved, and the destination folder. In the example below, I am going to move work from my Examples folder under My Work over to the Multiple School Group folder which is a group folder. You can select one piece of work by clicking it and dragging it, or you can hold CTRL and click on multiple pieces of work individually. You can also hold shift and click on a first and last piece of work and this will select everything in between. Using Shift + Click to select everything in between the first and last item. Once you have the pieces of work selected, you can then click and drag them to the destination folder. When you have dragged the work over, you will get the option to Move or Copy. The Copy option allows you to make a copy of the work, and it will exist in both the original folder and the destination folder. Once the work has been moved or copied, it will appear in the destination folder. 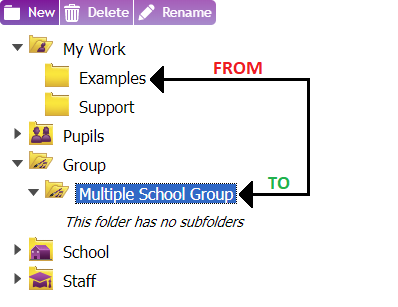 Did you know that if you move saved work into a cross-school group folder, other schools in that group will be able to see the work? 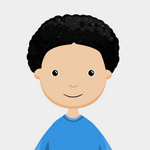 For more information, see instructions on how to set up a cross-school group: Can we use 2Email to email pupils and teachers at other Purple Mash schools?